Dawn Soltysiak began firing her pottery kilns with the help of solar panels. She explains how a small change can make a big difference for sustainability. Owner/artist Dawn Soltysiak operates the 30-acre sustainable farm, where she runs Khnemu Studio and fires her kilns on solar power. Visitors to Khnemu Studio on Fernwood Farm, about forty-five miles southwest of Grand Rapids, Michigan, would likely note the typical Midwestern rural farmhouse. A walk past the house, however, would reveal something unusual about the long barn that extends into the back pasture. All along the pitched roof lay 78 solar panels, absorbing sunlight and converting it to just under 25,000 kilowatts of electricity each year. Fourteen years ago Dawn and her husband Rob purchased the small farm and made the commitment to live a more sustainable lifestyle. They raise much of their food, including grass-fed beef and pastured poultry. Intrigued by alternative energy sources, she wrote a proposal to the USDA’s Rural Energy for America program (REAP) and was awarded a grant that provided 25% of the cost of renewable energy for rural small businesses. 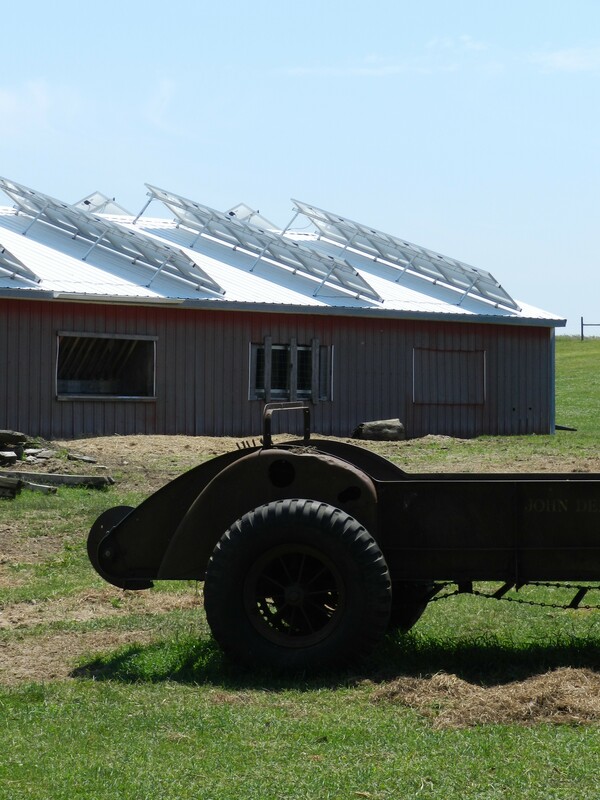 Her north/south positioned long barn offered the perfect place for solar panels and installation of the 17.94 kilowatt-hour solar array of 78 230-watt panels was completed in 2012. The electricity produced by the system is used to power the studio and the kilns. The daily average production is about 68 kilowatts a day, with a yearly average of 25,000. 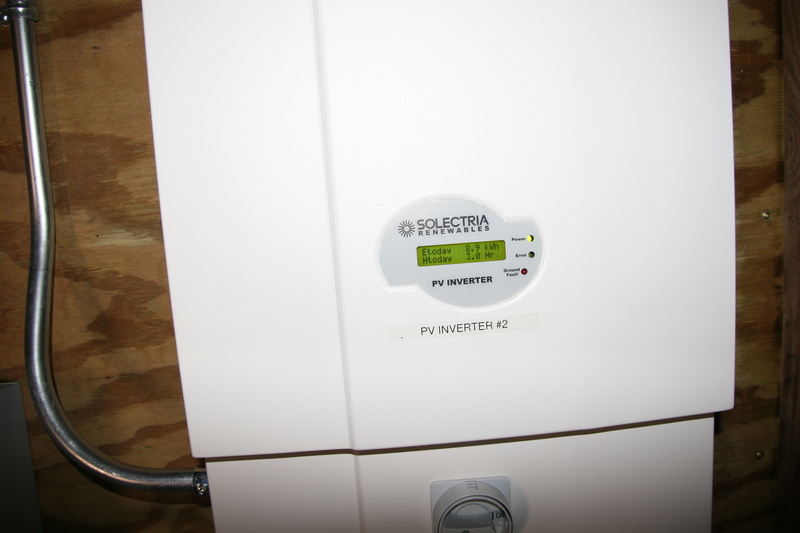 Dawn says that the average household uses about 10,000 kilowatts per year. She explains that the production is managed on a credit system: if on a given day, her production exceeds her needs, she earns credits. The energy is channeled into the nationwide “grid,” and is not stored in batteries. Dawn says, “If I make more than I need, why shouldn’t I share that with my neighbor? I would rather share it than store and potentially lose it – storage is limited and eventually lost.” On days when Dawn uses more than she produces, her credits make up the difference. For the most part, the system has met her needs, except for periods of excessive firings, for example, to meet a large commercial order. She estimates she will recoup the $53,000 cost of the system within five years, including the grant funding. Over the last 14 years Dawn has been making changes toward a more sustainable ceramics studio. This solar array provides the energy Dawn needs to run her pottery studio and gallery, where she teaches classes and workshops, as well as creates pottery production. She offers classes at her studio in a continual year-round cycle. For more advanced instruction, the studio offers workshops and hosts two visiting artists each year for weekend workshops. Over the summer of 2014, Dawn hosted hands-on workshops with Blair Clemo in June, and with Chandra DeBuse in September. Rural Energy for America grant (REAP) for small businesses through the US Department of Ag and Rural Development. Small businesses and farms in communities of 50,000 or less qualify for this grant which covers up to 25 % of the system. For more information click here. The system was engineered and provided by John Wagner. This is a wonderful alternative to using and paying for the energy required to run a shop. More soon to be potters and studios should be batting down the hatches and working the panels . great going .